i think the astro revolves around the ascendant and midheaven ruler mercury, being in the 8th house - sationary retro... mercury in turn applies to the square of pluto which is positioned in the 5th house - of children.. Interesting and insightful comments. I will try not to just regurgitate your observations and note a few other points of my own if I can. Leaving aside the vagaries of an exact timed chart here we have a general planetary configuration of both malefics (Mars and Saturn) very strong at present by sign ie exaltation (Mars) and domicile rulership (Saturn). In addition both planets are in conjunction. This conjunction is opposing the Moon (people) by whole sign in the chart you are using. Mars seems to be all over things at present. Which fits the signification for a fire very well. Mars is the dispositor of the Sun, Mercury, Venus , Jupiter and Uranus ( Chiron too if you use it which I dont). In contrast to the strength of the malefics both benefics are in a weakened state and both disposited by Mars. Venus is in its detriment in Aries while Jupiter is Rx. The benefics generally symbolize life affirming principles and protection from injury and harm (unless they are accidental malefics). Here their ability to provide help and protection is diminished. Mars forms a square to the Sun. If this time is correct its interesting the MC is on the Pleiades star cluster often linked to accidents and unfortunate events. This cluster is of the nature of the Moon and Mars. While the square between the Moon and Uranus is separating it is still operative. Mercury going stationary Rx gains greater significance ruling the ASC/MC angles and as you point out it forms a square to Pluto with Mercury the natural significator for young people and children from the 8th house. Mars is also out of bounds at present to add to the brew. 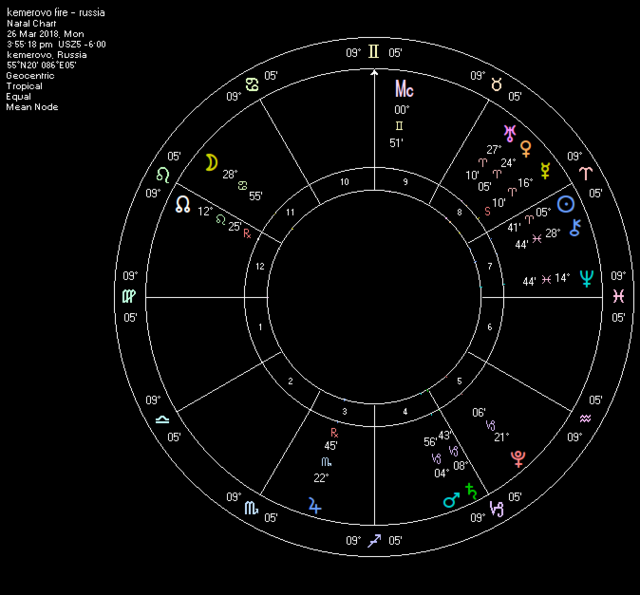 Well its a possible event chart so yes perfect for 20/20 astrology after the event. But as you suggest predicting the exact timing of something like this is another matter entirely. I haven't had time to study the last ingress chart before this tragic event (or sadly much of any astrology for a while) but I am sure it would be instructive.